Upon finishing Bastion my worries that the narration would grow stale were unfounded. The game changes things up enough both in gameplay and it's topic of narration that the gravely voice telling the story is always providing more insight into the world. 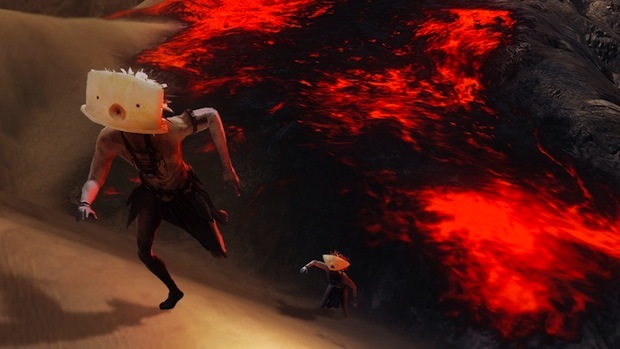 My other worry after playing only a few hours was that the story wouldn't live up to it's potential. Now that I've finished I would say that it could have had a more complex deeper story and benefitted from it, but it didn't need it. The story is simple in execution, easy to follow, but deep enough to stay interesting and make the player feel invested. In the end Bastion did not let me down in any way. One game mechanic I had not yet encountered when I wrote my first impressions is something I'd like to highlight now. At a certain point in the game The Kid can build a Shrine in the bastion. Once built the Shrine allows players to invoke the powers of various gods if they choose. The powers of the gods are all designed to make the game harder, but for each god invoked the player receives bonus experience and shards (money) as they play. This mechanic is something that I wish many more games would use because it allows players to set a custom difficulty for the game, and be rewarded for it. 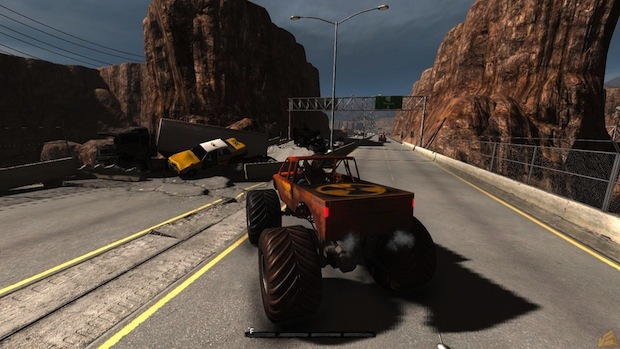 It has become standard in video games for difficulty selections to be made at the beginning of the game and often higher difficulties provide no reward except for the satisfaction of the challenge. Through the Shrine Bastion provides difficulty that can be modified on the fly, it rewards players for choosing to make the game harder, and also changes the game in creative ways. I hope that game designers everywhere take this as inspiration for how to customize difficulty. My final comments about Bastion will be spoiler ridden, so if you have yet to play through Bastion and don't want to know about the ending, consider this a positive review and stop reading now. Within the last bit of the game Bastion provides the player with two binary choices, whether or not to save someone who betrayed The Kid, and whether to end the game by resetting time and preventing The Calamity that started it all or to continue living in the ruined world. The latter choice is interesting to anyone who gets invested in the story, and I'm assuming changes the visuals and narration of the ending. I have only finished the game once so far, and I chose to continue living in the ruined world, holding on to the friendships made by The Kid on his adventure and avoiding the possibility that the Calamity would just happen again. The former of the two choices, whether to let the betraying character live or die was extremely well done. I chose to save the man, and The Kid had to put down his weapon to carry him. As The Kid marched slowly forward holding the unconscious body enemies lined their walls and shot at The Kid. As the player I was forced to use my healing items one after another and just when I ran out, and the game had me convinced that making this choice was going to kill me, the enemies seemed to realize that The Kid had chosen not to fight anymore and that he was trying to leave peacefully with the unconscious man. The enemies stopped firing. One enemy failed to hold his fire and started shooting again but was quickly knocked out by another enemy behind him. It is rare for a game to give me as strong of an emotional reaction as this did, and in this moment Bastion guaranteed it's spot in my personal top games of 2011 list. 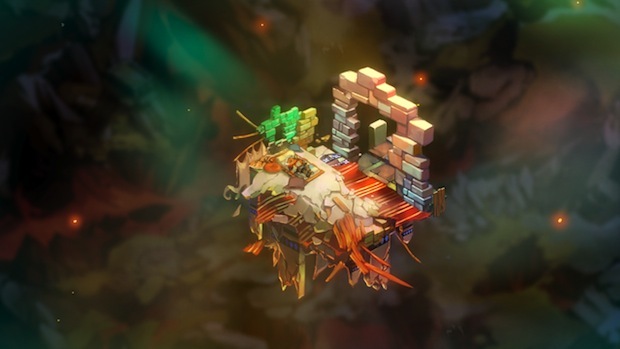 I recommend Bastion to anyone who can enjoy an action RPG. The graphics, music, story, and narration come together to create an experience that stands above many. I can't wait to see what Supergiant games comes up with next. 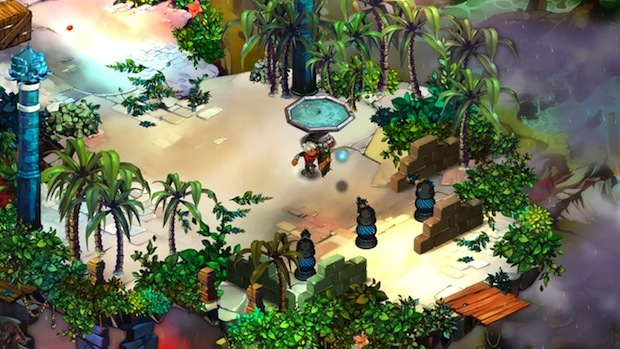 Bastion, a new Action RPG by Supergiant Games, was released on XBLA yesterday, July the 20th. The trailer for Bastion had caught my eye at E3 and I downloaded the game yesterday afternoon and got a chance to play it in the evening. After just an hour or two of time in the world of Bastion, I can't wait for more; honestly I'd rather be continuing my adventure in Bastion than writing this article. I will do my best to discuss my first impressions with Bastion without spoiling anything important, but beware minor spoilers if you like to dive into a game without knowing anything about it. In Bastion players take control of The Kid, a young(?) man who wakes up after the events of what the game calls the Calamity. The Calamity seems to have torn the colorful world into pieces, leaving only a few floating paths and platforms left. Setting out for the safety of the Bastion, as The Kid pushes onward what little is left of the world pieces together as paths allowing him to progress. After reaching the hub-like Bastion, The Kid must search for the world's Cores which have the power to rebuild the world around the Bastion. Though this premise is simple, and not a new idea for a video game plot, it is The Stranger that makes the game truly special. The Stranger is the narrator of the game, and from the first moment that the game begins this easy-on-the-ears drawl tells The Kid's story. 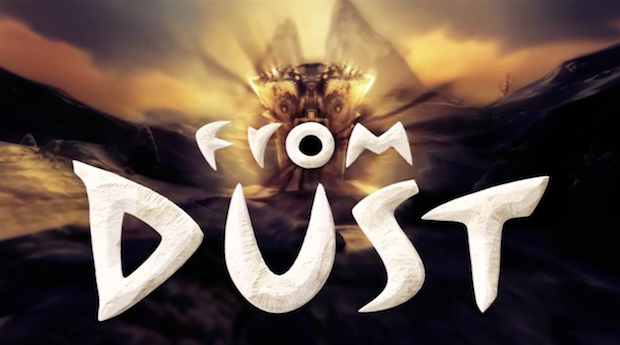 The narration is very well written, and dynamically responds to the player. For example, within the first 30 seconds of gaining control of The Kid, I accidentally walked off of the edge of the precarious world and without missing a beat The Stranger said something along the lines of "And then the kid fell to his death...just kidding" as I was dropped back onto the platform sustaining a small portion of damage. Within the first couple hours of the game The Stranger's narration is varied and consistent. He does not repeat himself when The Kid does something repeatedly, but instead narrates the players story as often is as interesting and entertaining. Backing up the excellent narration is a soundtrack that so far I am loving. The music so far is not extremely catchy – I didn't wake up this morning remembering a theme song – but I remember that it was beautiful and fitting for the world. If the music continues to provide variety, I will not hesitate to purchase the soundtrack if it becomes available. The graphics of Bastion are special in their own right, an interesting style that reminds me simultaneously of cartoons and water colors drawn into a world formed of floating chunks high above the distant ground. The sound design and graphics create a world that I want to play in, so of course I must discuss just how the playing goes. 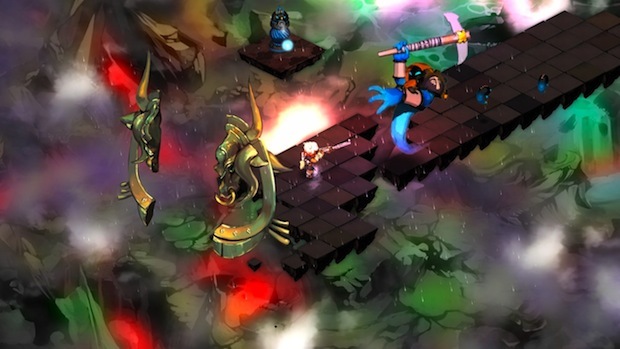 As an Action RPG Bastion's gameplay is somewhere in between the hack and slashing of the Diablo series, and the combat mixture of Devil May Cry. While Bastion does not have a complex combo system and long move list like DMC, The Kid carries two weapons, usually a short range weapon and a long range weapon, can easily use a shield, and has a dodge roll ability. The rapid transitions between beating on enemies with a giant hammer, firing off arrows, dodging enemies and blocking attacks remind me of the combat decisions in DMC but are paired down to a 2D plane and Diablo like viewpoint. The Kid does level up, as the RPG part of it's genre claim would suggest, but instead of a complex stat upgrade system, leveling opens up new slots for special distilled beverages. Each drink provides a unique status boost such as increased health, loot magnetism, or extra damage, and players can swap which beverages they fill their level slots with anytime they have access to a Distillery (which is often – you can build one in the Bastion hub-world). Combine the many beverage choices when you level, with a rapidly expanding list of special abilities, multiple long range and close range weapons each with their own choices of unlockable upgrades, toss in a variety of aggressive enemies and I think Bastions fighting system will be entertaining until the games end. 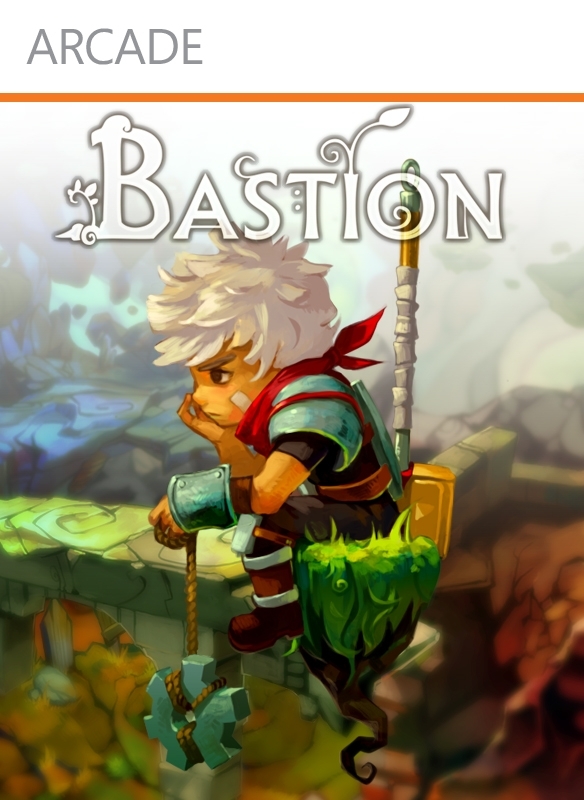 I plan on finishing the game before coming back to do write my final opinions on the game, but so far Bastion seems to be a fun and artistic game with no obvious flaws wrapped up in excellent narration. My only worry at this point is that the narration and story won't continue to be as unique and special as the game continues, and that the truly great fantasy story I am hoping for won't be there. When Sonic the Hedgehog 3 released in early 1994 it was really just the first half of the game originally planned by Sonic Team. 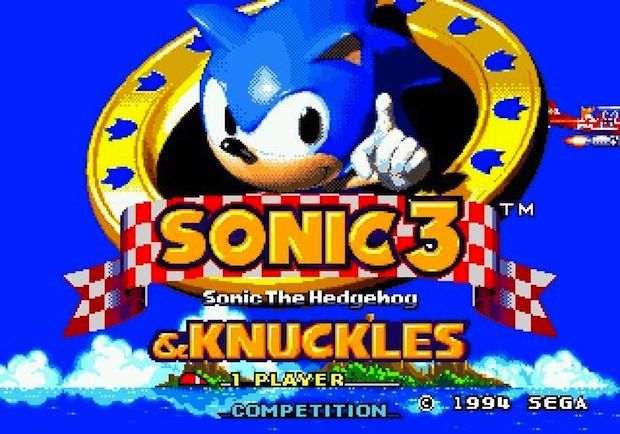 The third game in the Sega Genesis flagship series was not on schedule for completion by Sega's planned date, leading Sonic Team to split the game into two parts, Sonic the Hedgehog 3, and Sonic & Knuckles which released later the same year. The Sonic & Knuckles cartridge for the Genesis launched with the rather unique ability to "lock-on" to other cartridges. (The top of the cartridge could flip back allowing for another cartridge to be plugged in on top.) Depending on what cartridge was locked on players could use Knuckles in Sonic the Hedgehog 2 (attaching Sonic 2), access extra special stages (attaching Sonic 1), and most importantly to combine Sonic 3 with Sonic & Knuckles to create Sonic 3 & Knuckles, the game Sonic 3 was meant to be. My opinion of Sonic 3 & Knuckles is positively biased by nostalgia, because I absolutely loved it growing up and played through it many times. However, I will do my best to write a fair review based on replaying it recently with a friend. We blasted through the whole game in two sessions, playing Sonic and Tails together. It was a game he had never finished as a kid, so I felt he should see the entirety of the classic at least once. Playing Sonic and Tails brings up an immediate complaint about cooperative play. For the sake of preventing frustrating, having Tails be unable to detract from the players life count or lose rings is a great design choice that lets a less experienced player be included without frustration. The fact that Tails cannot ever die permanently also makes the Tails player perfect for recklessly assaulting bosses, though this can take away the challenge and therefore possibly the fun of a boss fight. The big problem with Sonic and Tails cooperative play though, is how hard it is too keep tails in play with Sonic. Tails is able to leave the screen and get left behind, and this happens every few seconds in the hectic speedy parts of the game. After getting far enough off the screen Tails resets, and will come slowly flying back on screen with his two tails. This return is far to slow to keep a Tails player in play for much of the game however, and I think the cooperative aspect of the game could have been greatly improved if Tails had simply quickly jumped or run onto the screen and was immediately back in control. The speed that leaves Tails behind so often is of course iconic for Sonic the Hedgehog. 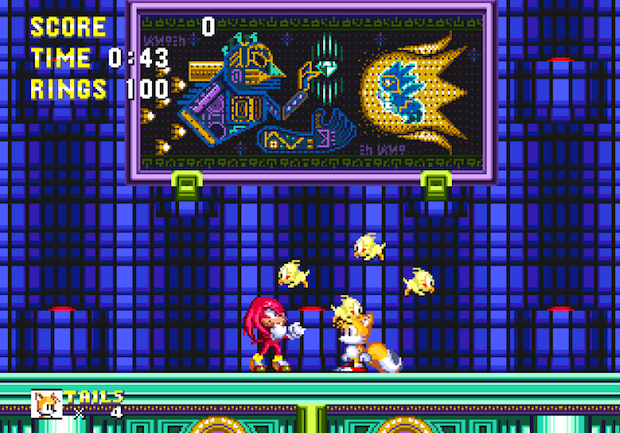 With loops, bumpers, jumps and a variety of power-ups players will rush through Sonic 3 & Knuckles at great speed. However the speed is tuned well enough that an attentive player can respond to a trap or enemy that comes into the screen before Sonic reaches it preventing frustration that often comes with fast games. Also, there is much of the game the game that cannot be played at full speed, such as dangerous platforming segments, and rooms that have some form of switch or control to be found before the exit opens. The parts that force the player to slow down provide a welcome change of pace and keep the parts that are fast from going stale. The level design can be complemented not only for it’s pacing, but for its multiple paths and lack of cheap death pits. Sonic 3 & Knuckles provides large platforming environments that often have two or three branching paths through them, and some paths are only accessible with Tails ability to fly, or Knuckles ability to climb and break through rock on contact. These various routes are laid out in such a way that the lowest route rarely has any gaps that would allow the player to fall out of the level and die. This means that in most circumstances if Sonic or another character misses a jump and falls, they land in a lower area of the level instead of dying. The exceptions to this are usually found in levels that are meant to be high in the sky, and the death pits are use to symbolize falling off of the level entirely. In the end rushing through levels is very satisfying but there are plenty of secrets and obstacles to discover and avoid at a slower more exploratory pace. The game controls as all of the original Sonic games do, very simply and responsively. There is only one button, jump, which is also used to get a speed boost with a “spin-dash” if tapped while stationary and pressing down. If jump is pressed when Sonic is airborne a brief flash of lightning surrounds sonic protecting him from damage and slightly expanding his effective diameter which is very useful in attacking enemies. Tails can fly temporarily with his two tails if jump is pressed rapidly while he’s airborne, and Knuckles is sent into a gentle glide which allows knuckles to latch onto walls and climb. All three characters control with an excellent balance of momentum and control, allowing players to be agile without feeling like they are weightless. The environments are colorful easy to look at, and while some textures are repetitive for a game made in the mid 90s there is as much detail as I would expect in any platformer. The character animations for Sonic, Tails, and Knuckles are fluid and vary greatly depending on the situation. Some rotating platforms will spin the characters displaying sprites from all angles, and the way the characters are animated through different running speeds and poses is quite smooth. The enemies are more simply animated, but are well done sprites nonetheless. 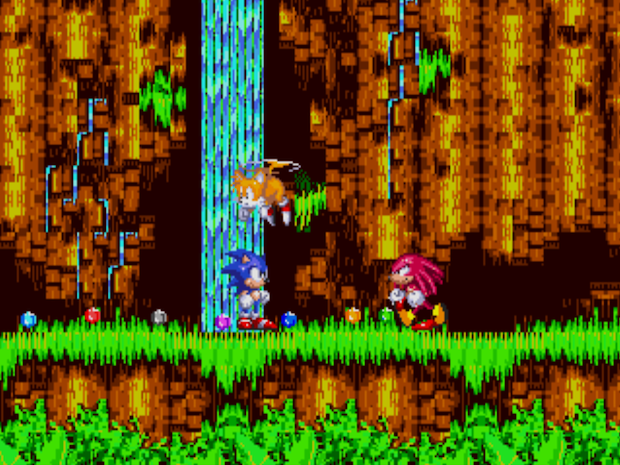 Playing through recently I did encounter some sprite layering glitches where Tails was behind the background instead of in front which creates some pretty poor visibility issues, but this seemed to be a fairly uncommon glitch that only occurred in specific circumstances. The portrait on the back wall is a prophetic hint at the optional final boss. To people who grew up playing Sonic the Hedgehog games, the music is often considered memorable and high quality. Sonic 3 & Knuckles is no exception, and the music for most levels is catchy, fitting for the environment, and loops quite well. 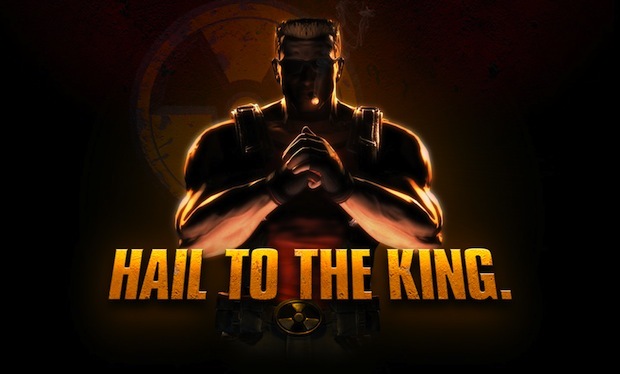 Fans of old video game music will probably appreciate the soundtrack. The sound effects of the game are simple and effective, also well matched to their causal action. Sadly, one of my biggest complaints about Sonic 3 & Knuckles relates to music and sound. The loop of music that plays when a character becomes invincible is too short for the games good. If Sonic opens an invincibility power-up, the excited musical loop plays for a bit, but the power-up does not last long enough for the repetition to become an issue. 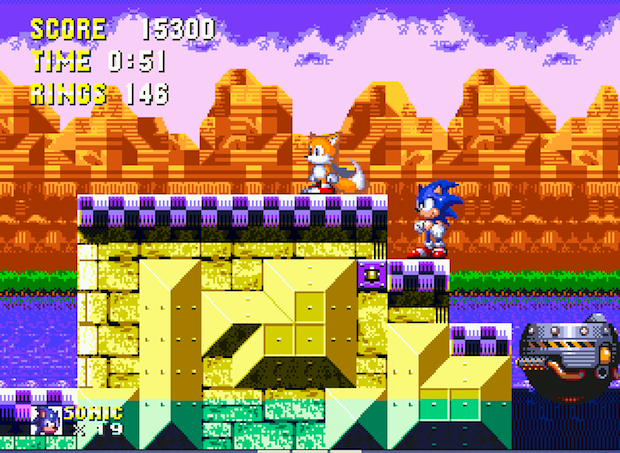 However, if a player is good enough to collect all of the chaos emeralds hidden in special bonus stages throughout the game, Sonic can turn into the golden colored extremely fast Super Sonic, which also triggers the invincibility music. When this happens, Sonic is invincible to most forms of damage but his rings (the common collectible in Sonic games that are dropped when Sonic takes damage) count down. When they reach zero Super Sonic reverts to normal blue Sonic. However, a good player can collect rings as they rush through a level, and stay in Super form for quite a long time. The music punishes these good players by forcing them to listen to the short loop of invincibility music the entire time, overriding the much more varied and tolerable music from the zone Sonic is in. This seems like a major oversight in sound design to me. [Anyone who already knows they like Sonic music, or people who are interested in it and like video game music, should check out Project Chaos which is an entire album of remixed music from Sonic 3 and Knuckles.] Sonic 3 & Knuckles as a game is a solid piece of work. 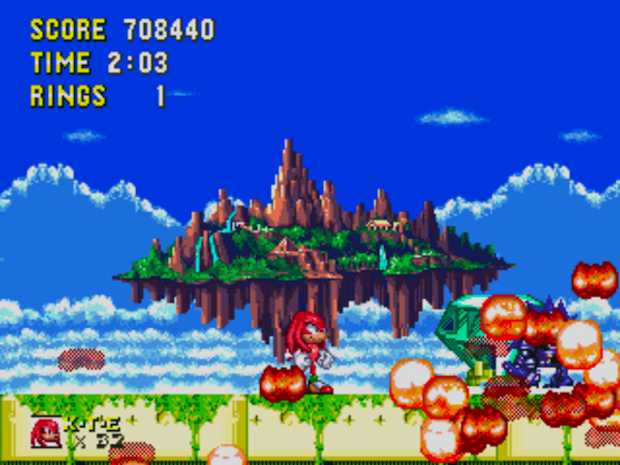 Environments are pretty, exciting, and dotted with mini-game special stages to gain power-ups and rings, as well as special stages where Sonic, Tails, or Knuckles is controlled from behind while running on a giant sphere to collect blue orbs and unlock a chaos emerald. When players progress from the levels within the Sonic 3 cartridge to the Sonic & Knuckles cartridge new super emeralds unlock leading players to even greater power. The story is told through brief character interactions and level transitions. While still a simple story like most platform games of the 90s, the bits that are there help provide a sense of connection between the different levels, and display the plans of the evil Dr. Robotnik in a quick understandable way. Collecting rings and finding power-ups feels important for the sake of survival, but being without isn’t frustratingly deadly. The boss fights against Dr. Robotnik’s robots are extremely varied, but fair in difficulty. No one boss should stump a decent player for too long once they recognize the pattern. A final touch to make this game stand out, especially considering the time it was made, was that the game saves automatically, allowing players to start on the level they left off, it has multiple save files to provide for the variety of character choice and multiple players, and when a game is completed in a save file, players can then use that save file as a level selector to replay the game from any point with whatever chaos emeralds and extra lives they had collected. The game begins with a brief cut scene in which Sonic loses all the chaos emeralds he collected in Sonic 2. Replaying Sonic 3 & Knuckles let me realize just how well designed it was even by todays standards. Sure, games today are often much longer, and obviously the quality of graphics and sound has greatly increased over the years, but for it’s time Sonic 3 & Knuckles demonstrated the strength of good game design, and is one of the best examples of the platformer genre in the 90s. In 1978 Japanese company Taito released the original Space Invaders game, which became immensely popular and is still an extremely well known, if less often played, classic game. Game designer Shigeru Miyamoto, creator of Mario and Zelda, mentioned Space Invaders as the one game that revolutionized the game industry. Not only did Space Invaders drive the popularity of video games forward, but I would brave the statement that it also spawned the continued popularity of shooters, whether they are top-down, side-scrolling, or even 3D shooters like the Star Fox games, as it was the first popular game to pit the player against an onslaught of approaching enemies. 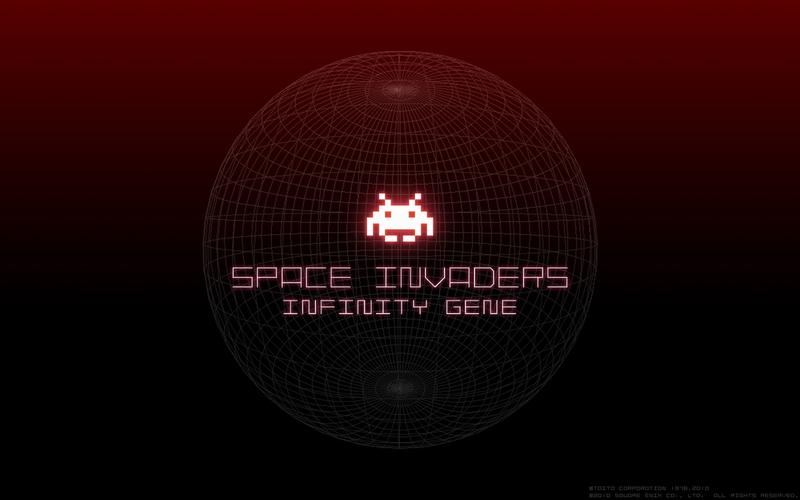 Space Invaders Infinity Gene was released for iOS (iPhone/iPad/iPod Touch) in July of 2009, and then later in September 2010 it was released for the Xbox Live Arcade and Playstation Network. The version I’ve been playing is the XBLA version, which is supposed to be identical to the PSN version, but has more features than the original iOS version such as HD graphics and extra ship-variations. The “Normal” mode of Infinity Gene begins with Charles Darwin’s quote above, setting the stage for evolution themed gameplay. The first level begins with a tribute to the original Space Invaders, and then quickly transforms into a fast paced modern shooter with classic Space Invaders graphics. 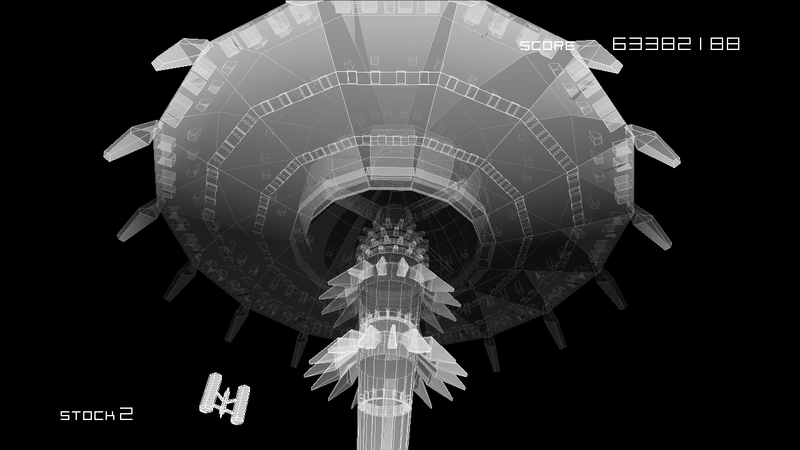 At the beginning of the game the ship can only fly left and right, as in the original, however as players earn points and complete levels they fill up an evolution bar which advances gameplay. Over time the abilities to move anywhere on screen, upgrade weapons, or use ships with all new weapons, become available as the game evolves. Evolution also provides the ability to do “Nagoya Attacks”, an interesting ability which allowed my ship to fly through enemy shots in the first few frames of their existence on screen. 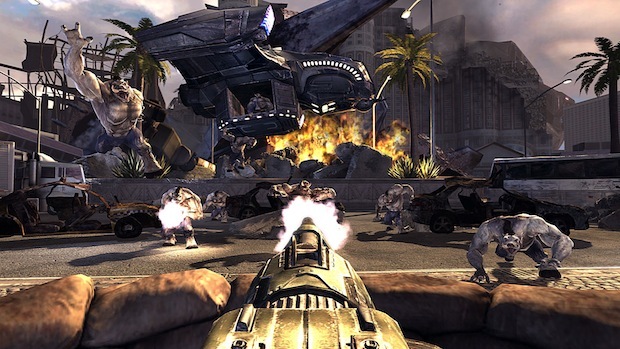 To keep up with the players increasing abilities and firepower, the game not only presents more enemies and new bigger bosses, but also increases the complexity and quality of the music and graphics. 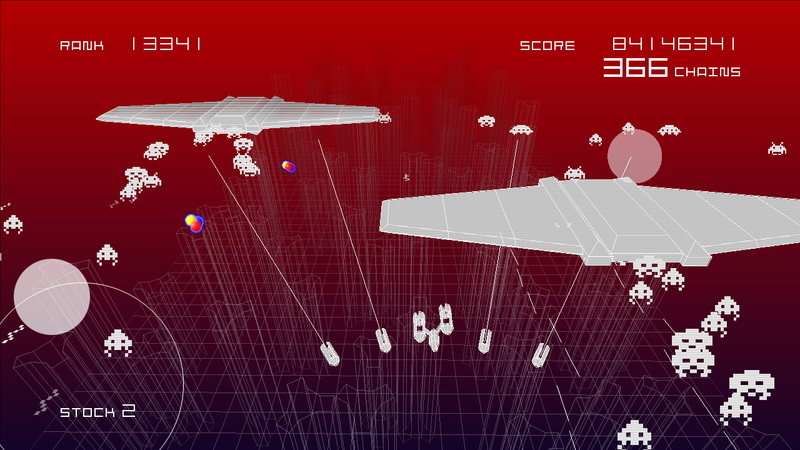 By the end of the game the graphics have become polygon based 3D graphics, and the music various thumping techno tracks. Later levels introduce an angled perspective. While unlocking vertical screen movement and new weapons does change gameplay, the game never gets much more complex. I eventually completed the game just by holding down the right trigger and flying carefully; dodging the swarms of enemies and bullets is the primary challenge. For the most part the more “evolved” ships are more powerful when they are unlocked, making the early ships fairly useless for the later levels. While a more balanced array of ships to fit different play styles might have been nice, it is exciting to “evolve”, receive a new ship, and have it be something new and powerful that helped me get past the increasingly hectic levels. While I found evolution theme applied to what is essentially an upgrade bar a cool idea, it got less exciting when I realized that the same bar was used to unlock all the sound test tracks and bonus levels as well. Only a scattered few evolutions actually improve your gameplay abilities, and then when you’ve finally unlocked the last ship, the evolution bar goes away and there are no more unlocks. It seems that the music unlocks were used to increase the time it takes to unlock ships and artificially extend the process, and while the extension is appreciated, more exciting unlockables would have been appreciated. 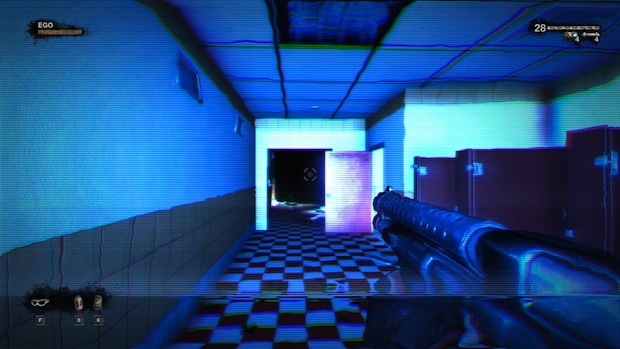 Infinity Gene’s sound and graphics hold up through the whole game as an effectively modernized nostalgia trip. While the backgrounds gain some simple colors, the player’s ship and enemies are always just white, even when the graphics step up to simple 3D polygons, making the visual experience never too far from the recognizable classic Space Invaders. The increasingly complex techno music that backs the game is effective and exciting though certainly nothing revolutionary as far as game scores go. The sound effects of ships firing and exploding are all inspired by the original arcade sound effects. UFOs still make that wonderful oscillating “wa-wa-wa-wa-wa” noise when they get shot down, and enemies explode with a similar note, keeping everything familiar. Progressing into the later levels I was struck by one annoying flaw in the sound of the game; it seems that when too many sound effects occur at once something goes wrong with the games interaction with Dolby surround sound and the sound will pop and go out for an instant. This doesn’t effect gameplay but makes listening to the game with the volume up fairly annoying on hectic levels. In all, Space Invaders Infinity Gene is an excellent modern tribute to one of the games that helped start it all. Sound and graphics effectively create nostalgia, while the bullet-hell gameplay lives up to other modern descendants of the shooter genre. The overall simplicity of the game is a disappointment considering the games long normal mode, extra Bonus and Challenge modes, and even a music mode allowing levels to be created based on music players have on their Xbox. Played in short bursts however, Infinity Gene is a great way to remember gaming days of old while simultaneously experiencing just how games have (and haven’t) changed in the last 30 years. Giant UFOs provide epic boss fights. When I sign into Xbox Live and check what games my friends are playing, more often than not, the answer is one of many first person shooters. 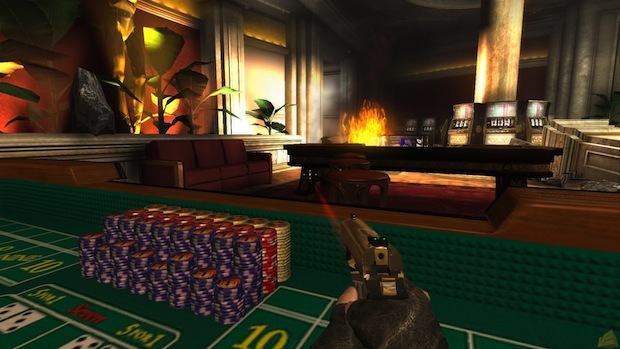 The FPS genre has morphed from its popular beginnings as primarily single-player adventures such as Wolfenstein 3D (1992) and Doom (1993) into the genre of choice for an evening of multiplayer online gaming. As the genre has grown in popularity, certain franchises have climbed to the top, and everyone has their favorites. Most of my friends are Xbox 360 owners, and so the biggest rivalry I have witnessed is between the Halo games, and the Call of Duty games. Regardless of personal preference, I want to play games with my friends when I can, so I have spent plenty of time with games from both series. Then, within the last year, a third FPS called Battlefield: Bad Company 2 started popping up on my friends list. 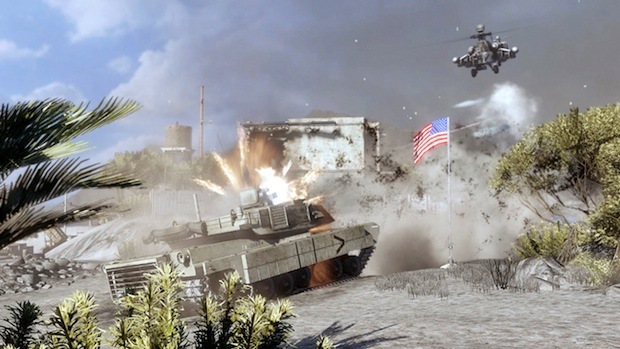 As I was already playing Call of Duty and Halo, and I had played a Battlefield game before, I didn’t rush to get Bad Company 2 when it was released in 2010. It wasn’t until early this year that my closest gaming buddy picked up two copies for us. So now I’ve played all three, and I’m surprised to find I continue to do so. Though I have my own game preferences, the purpose of this article is not to bash on one game or another. I’d like to discuss the pros and cons of each series, perhaps creating a triple review of sorts, using the most recent entries, Halo: Reach, Call of Duty: Black Ops, and Battlefield: Bad Company 2. And for the sake of comparison I’m only going to consider the multiplayer components of these games. Triple Multiplayer Review Halo: Reach, Call of Duty: Black Ops, Battlefield: Bad Company 2 Graphics Graphically, all three games impress. That isn’t to say the graphics couldn’t be better if the games were developed for a high-end gaming PC, and perhaps Call of Duty and Battlefield look better on the Playstation 3, but on the Xbox 360 the games look good enough that they don’t distract to gameplay. However, each game has a very different graphical style. 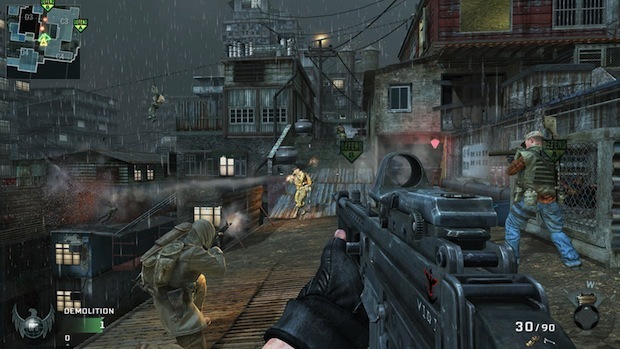 Call of Duty: Black Ops seems to go for the “realistic” video game look the most of the trio. Sadly, this means a lot of brown and grey. There are other colors when the levels include bright signs or plants, but they always look like they are covered in dust. Screenshots of the game show off the detailed textures that look great, especially on the character models. However, once the game is in motion most of the details blur together. As many of the firefights happen at range the graphics go to waste as players are busy shooting at every enemy they can see. 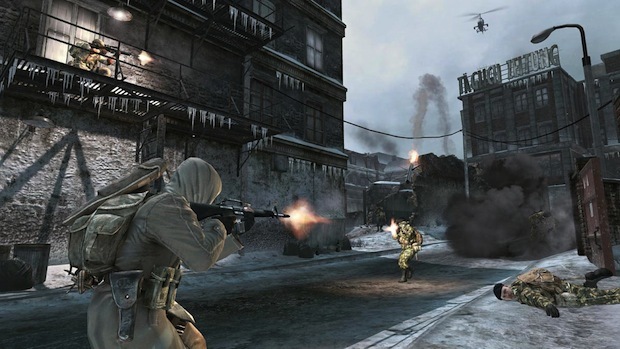 The style does come in handy though, as the lack of bright colors makes sitting still the best camouflage for snipers. And regardless of how you play, the well designed gun models look great in your characters hands. 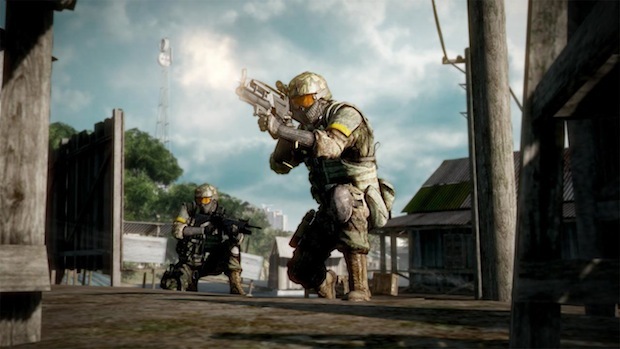 Battlefield: Bad Company 2 has a lot in common with Black Ops visually simply because they share the modern military setting, but Battlefield developer DICE’s Frostbite engine provides a bit of a different look. When I first jumped into a game of Bad Company 2, I did a double take because for a split second I thought the game was somewhat cell shaded. I quickly realized I was wrong, but the lighting in the game has a brightness, and the shading a sharpness, that isn’t shared by Call of Duty. This makes the game world look perhaps a little less realistic, but I find it brings more life to the action of the game. Like Black Ops a lot of the color palette is brown and grey, but the trees, bushes, and even the blue skies are more vibrantly colored bringing shocks of color to the environment. The texturing seems plenty detailed for the size of the levels, though I did notice that because of the level size there are more graphical repetitions. For example, often a lot of the buildings within a level will be identical, as if the level designers copy and pasted one structure all over the place to save time. This is no surprise in levels that take minutes to run across but the structural uniqueness of Call of Duty is preferable. 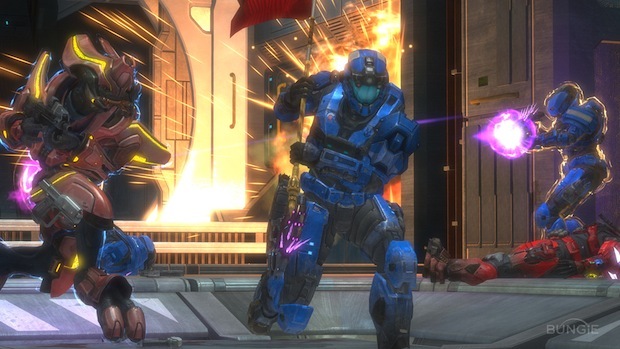 Halo: Reach is the most different visually of the three, and I have heard of plenty of people who find it too “candy-colored” for their taste. 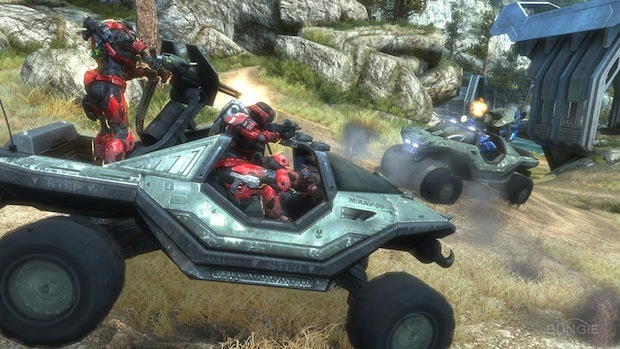 Halo’s visuals represent the most science-fictional game worlds of the trio of games in question, and the colorful environments seem to enhance that. The visuals for the futuristic and alien technology are flashy, colorful, and fun without straying too far from what we are used to in a shooter. Player armor coloration is usually bright making stealth more a matter of staying out of sight completely than using the graphical cover to hide. 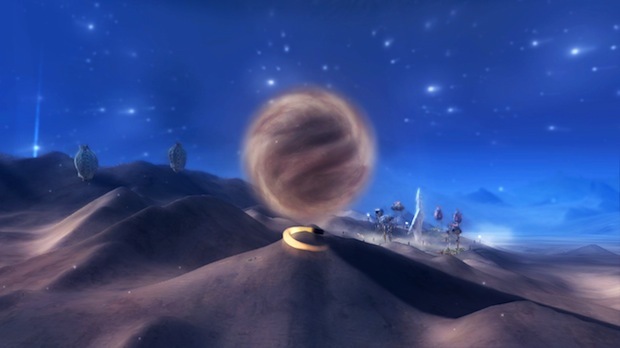 The background environments in the multiplayer levels are often beautiful works of science fiction art, with space battles, mountains, or interesting weather effects in the distance. Players who don’t feel that their games need to look as realistic and dirty as usual will appreciate the style more than others. The texturing is quite detailed which is nice most of the time, but to compensate the game does suffer from some noticeable “texture pop”. This means that when using the scope on many of the ranged weapons it sometimes takes a split second for the textures to exchange for their higher resolution variants to compensate for the players closer view. This is especially noticeable in split screen play when the game has to work harder to keep up with the amount on screen.